Why did you decide to launch an event about customer experience in 2013? I decided so because I am convinced that companies, trademarks, even local retailers who do not care about that topic are doomed. E-commerce and the low cost madness made a complete disruption in the way you win over clients and create customer loyalty. For instance, in France, a “baguette tradition” (a fancier version of the regular baguette) costs 1,30€ at your local baker, but 0,80€ in any supermarket. Other example: if I decide to buy a book, Amazon will make sure I get it fast and cheap. Actually, whatever the industry, one has to choose between being the cheapest – because they can – or becoming a real merchant again and listening to their clients. The clients await quality products and quality services, but they also long for a certain kind of emotional signature, or some other key-factor that will make the difference – such as reduced queuing, service customization etc… A merchant is someone who imagines, someone who creates and delivers a different and quality customer experience thanks to an emotion, a “signature”, some kind of gesture. I believe that is the difference between a plain seller, whom you will only get in transaction with, and a merchant, whom you will build a relationship with. In my life I have been a bookshop owner, a carrier, a ski seller, an adman, a consultant, a movie producer, and here I am now: an editor. I have learned something crucial through those experiences: the client is the king, the referee in this game, and he/she wants even more now. One can see the greatest, most well-known companies and trademarks are the ones who got these ideas into their systems. Back when I was selling skis, the 7S was more than a plain board. It was THE model that Alberto Tomba was going from one victory to another with! We had read its description so many times, we knew by heart its composition and its sidecut! Rossignol was not only offering a specific ski model but also a piece of history, which had to be earned: back then, we always made sure that our retailers were true specialists, that they were perfectly able to explain to the client what they were selling them. This even applies to one of my other passions: why has Bruce Springsteen been the Boss for more than twenty years? Because he gives three and a half hours long shows, and because he plays with the E-Street Band. Talking about organization, why name it “The French Forum”, and why make people come outside of Paris for two whole days? Retail specialists only had one great meeting until 2013: the NRF (National Retail Federation) Congress, which takes place every January in New York City. Also, when talking about champions, the same companies are always mentioned: Amazon, Apple, Asos etc… even though we do have actual masters of customer experience, shopping experience and UX design : entrepreneurs, testers, solutions editors, customer experience formation specialist etc… For instance, when the SNCF (the French national railway company) decides to put pianos in each station, it changes things. Also, the FNAC (an equivalent to Waterstones in the UK) creating special cashiers and phone lines for its best clients or organizing click-and-collect proves they understood they need to defy Amazon on this customer experience field. Moreover, someone like Gérard Collard (a well-known bookseller in Paris), at his bookshop la Griffe noire, actually choosing books, reviewing them and putting up a website shows how he cares about customer experience and how he wants to differentiate himself from others. As the editor of a magazine dedicated to all customer experience issues, I did get a chance to come across and get to know those trend-setters. Saying we have champions in France as well or that we at least have the potential to grow them is an easy and natural statement for me to make. 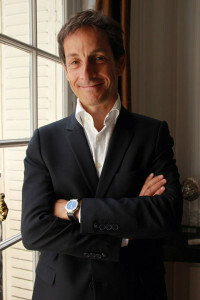 Hence the name of the event: “Experience Client – The French Forum”. To be honest, I have had my fair share of conferences and keynotes about the internet and all digital matters: always the same persons, always the same speeches. While creating the event, I dreamt and wanted to reach the power and the relevance of the Collège de France lectures (the Collège de France is a great higher education institution). An old man wearing flip-flops, only using a few cheat cards in a plastic bag can radically change your point of view on an apparently minor matter. And that also makes the difference. So when it comes to the event, one rule only: the best, most authentic stories, by the best tellers. No blathering, no so-called experts who never even real clients or managed any company or team. We need two things: concision and illustration. And one last thing: this is the “French” forum, so every conference will be held in French, none of the frenglish lingo spreading everywhere else. Why La Baule and this beautiful hotel? The luxe and the hotel industries are two of the most advanced industries when it comes to customer experience: we can benefit from them and import some of their knowledge. Moreover, I am convinced that nice places provide the right alchemy to learn, work together and exchange. I only had three days, in April 2013, to find a place that would host 120 entrepreneurs, three hours from Paris. 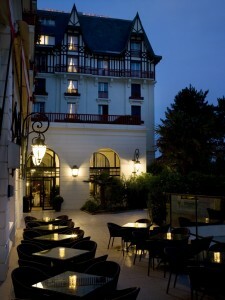 The Hermitage Barrière team was reactive and dedicated, which I liked. They did a wonderful job and I decided to set the event there. Saying customer experience helps with client loyalty is not just words! 1900 euros* for two days in La Baule is still a bit much, isn’t it? It’s nothing, it’s a steal! (smiles) Our promise towards participants and attendees is clear. We guarantee the former a motivated audience, paying close attention to them: a solo entrepreneur, a marketing or customer experience director, a consultant wanting to learn more, who all come to listen and share in La Baule and who are ready to spend money and time on it. Those are two rare resources nowadays! We offer the latter a full-on 360° view on the customer experience matter, thanks to thirty masterclasses and short conferences. It gives them a chance to exchange, to meet decision-makers in a privileged environment. In the music or the dance industry, you can be a virtuoso and still want to face the best; in that case, you’ll do everything to get into Juilliard or Berklee. If you are the next customer experience’s Quincy Jones, Diana Krall or Pina Bausch – alumni of those schools – or if you want to become them, meet us … in La Baule!